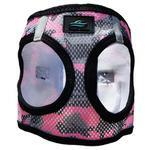 The American River Choke-Free Mesh Dog harness in Pink Camo is a great choice for dogs wanting to look outdoorsy, feminine, and a little tough. But this fashionable harness isn't just for looks. Trachea safe - The Choke-Free patented design pulls only from the chest, never the neck. 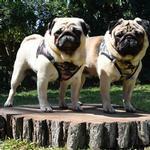 Many smaller breeds are susceptible to having a collapsed trachea, especially when using a collar. 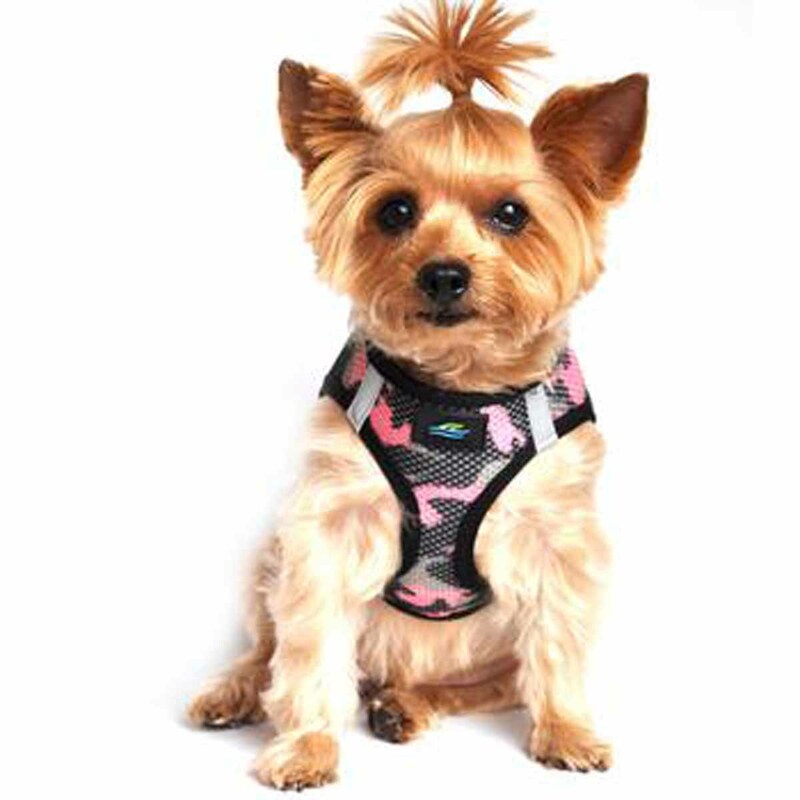 Even regular harnesses can be dangerous for toy and teacup breeds. Don't put your pup's airway at risk with anything but a choke-free harness! Patented Conforming Shape Fit Seam Technology - This unique feature allows the harness to conform to curves even on hard-to-fit dog chests. Patented Closure Slide Adjustability - Most harnesses have little or no size adjustment at the clasp. This unique design allows the clasp to slide along the nylon webbing for a full 3 inches of adjustment. Double D-ring - Most harnesses have only a single D-ring. Furthermore, some companies use D-rings that aren't welded shut. The remaining slit in the metal of sub-par D-rings may open under pressure and the nylon could slip out, leaving your dog at risk for escape. Since the American River Choke Free Harness features two welded D-rings in its design, you're getting double the protection. Reflective strips - All of the colors of American River Choke-Free Dog Harnesses feature reflective strips that can be viewed from the front and the sides to provide visibility during nighttime or early-morning walks. Zig zag trim binding stitch - Using a zig-zag stitch over the harness trim ensures there will be no missed stitches. This means the trim and the mesh fabric are fully bonded to each other. Safety – The choke-free design makes this harness an ideal choice for use as a car seat belt harness since it pulls from the chest, not the neck. Double safety closure- Wide touch fastener and high-strength plastic buckle clip ensure your dog won't be able to get out of the harness. When paired with a leash through the double D-rings, the harness has three levels of closure strength! Easy to apply - The step-in design makes putting on this harness a breeze. Once your pup has stepped into the harness leg holes, wrap the harness up and around your pup, angle the touch fastener for the best fit, click the clip, and go! Easy-care fabric- Soft mesh polyester is machine washable. Line dry. American River Camo Choke Free Dog Harness by Doggie Design - Pink Customer Photos - Send us your photo! Bella feels pretty and secure in her new American River Camo Choke Free Harness. She also loves her new matching leash! The bungee is perfect for long walks in the woods when Bella may or may not be unable to resust the urge to pull! Delilah loves her new Mesh Choke Free Harness! Perfect fit, comfy, and she was rarin'to go for a walk immediately! Afterwards, just as easily took a nap with it on! Thanks Baxter Boo! Posted On 05/25/18 by Gail D from , FL Yes, Gail D recommends this product! It is difficult to fit our Chorkie but this fits well and we get many complements. Posted On 11/13/17 by Vicki H from , ID Yes, Vicki H recommends this product! I ordered this for my Granddog, a 9 lb Chi-weenie. I bought her a size small, since her chest is 13". It's a liitle large on her, but she wears her warm coat under it & it fits very nicely. I purchased one previously for my Shih Tzu , & love it. Posted On 11/01/17 by Gail D from , FL Yes, Gail D recommends this product! Our chihuahua/terrier mix is difficult to fit and this works well with her round belly but tiny neck. It is amazingly simple to put on and looks adorable. Posted On 08/26/17 by CHERYL D from Virginia Beach, VA Yes, CHERYL D recommends this product! My order arrived promptly and this harness fits my Malti Pom perfectly. I ordered size Small for 9 pound dog. I highly recommend these Ultra Choke Free harnesses, because they do not have a buckle that goes under the throat area. My dog pulls a lot on the leash, so I do not want to choke her on the harness. These are the best harnesses because they have one buckle on the back, just one buckle to snap. Very easy and fast to get on and remove. I have several of these from Baxter Boo. Posted On 06/12/17 by melinda m from Scottsdale, AZ Yes, melinda m recommends this product! Measured my dog and her weight on the table directed me to get a small but she slips right out of it and it would cost too much to ship it back to exchange. Product is perfect - size table - not so much! Be aware that it must run big. Posted On 05/15/17 by Christine F from , NJ Yes, Christine F recommends this product! This was the first choke free harness I ever purchased for my Pomeranian puppy. I found myself going back to it again and again as she grew. I find it very easy to put on even when she gets squirmy. Just put her feet in the holes and Velcro. I then can snap it closed. I do have a few cute dresses that Velcro under the belly, but this particular harness gives me a sense of security because I feel she's safe when wearing this one. And as cute as I find the dresses she is still a puppy and spins in circles with the skirt in her mouth. I really appreciate that I can just put this on her and go. Posted On 05/11/17 by Ron E from Channahon, Yes, Ron E recommends this product! Posted On 05/09/17 by Gerald G from Spring Hill, FL Yes, Gerald G recommends this product! The vest fit my puppy just right! It eliminates pulling on the puppy's neck. My only issue is when the puppy shakes the "two" rings for the leach make quite a chatter. Posted On 04/23/17 by Michelle B from Concord, NC Yes, Michelle B recommends this product! Love this Harness! Perfect for small breeds. Fits well as long as you measure properly. Does not tug at the throat/neck. First harness I've found that does not sag in the front. Just overall perfect. Posted On 03/10/17 by Debra K from Trenton, FL Yes, Debra K recommends this product! We just love the products we received from Baxter Boo. The harness fits Bella perfect. She actually likes walks now. No neck pulling. Thank You and we have spread the word of the Baxter Boo Site. Posted On 02/26/17 by Valarie J from Springfield , VT Yes, Valarie J recommends this product! Posted On 10/18/16 by krolhouse from Bronx, NY Yes, krolhouse recommends this product! Functional harness with camo flair! Posted On 09/24/16 by Beth S from Atlanta, GA Yes, Beth S recommends this product! Well made. Runs a teeny bit big. Otherwise love it. Posted On 08/27/16 by Jane C from Show Low, AZ Yes, Jane C recommends this product! Although I measured my dog, this harness is a little too small.My dog has a similar harness that is adjustable in small which has plenty of room to grow. Posted On 06/16/16 by Tamee T from Bethel, OH Yes, Tamee T recommends this product! Posted On 05/26/16 by Carol K from New PortRichey , FL Yes, Carol K recommends this product! My girl and boy look wonderful in their camo outfits. I bought the solid cover ones previously, pink and blue, and loved them. I found one issue that could be improved. I bought the xxl and they were too small, i bought the xxxl and they were too big. The buckle on the top that clicks together would work perfectly if you had an adjustment on them. So I tie the buckle before snapping closed. That would be a great needed improvement. other harnesses I have all have the adjustment on them. Posted On 01/31/16 by Pamela N from North sandwich, NH Yes, Pamela N recommends this product! Posted On 01/17/16 by Maxine G from Boynton Beach, FL Yes, Maxine G recommends this product! Pups will look adorable in it. Love the design. Posted On 10/10/15 by Sandi W from ADRIAN, MI Yes, Sandi W recommends this product! I love this harness.This is my Sophie s second one.They fit well, in fact I have given away the other ones I had. she can't get out of it and it protects her throat. lots better than a choke collar. Posted On 10/06/15 by Margueritte C from Temecula, CA Yes, Margueritte C recommends this product! Cute! Colorful! Secure! Safety first and this harness delivers. Velcro and straps to secure the harness and also buckles on the top back area and not on the tummy! XXSMALL fits Maltese 4.5 pound. Posted On 07/02/15 by Karen S from Coral Gables, FL Yes, Karen S recommends this product! I purchased this harness for style because we have a home in NC and camo is definitely in! When it arrived I realized with the quality and comfort it is fast becoming my favorite. If you want style without sacrificing comfort or safety, this is the harness for you. Posted On 06/19/15 by Marie k from Greenville, NH Yes, Marie k recommends this product! Just got this today I am so very happy with it! She has no problem with it on, walking around and no pulling or choking. Very well made. It's so adorable that I'm thinking of getting another one in a different color. Posted On 06/11/15 by Terri J from Lakewood, CO Yes, Terri J recommends this product! This pink camo harness is very cute, good colors! The l and XL just were a little off for our dog. She's broad chested and has a little neck. But the customer service has been really great trying to get it right!! We will keep looking! Posted On 04/08/15 by Linda Karau from Apple Valley, MN Yes, Linda Karau recommends this product! The harness we purchased is fantastic! Fits perfect, is easy to put on or take off. Fastens securely, velcro and buckles holding tightly. A comfortable neck opening and roomy leg holes as well. D Rings for leash attachment are very easy to connect and very strong too. Plus, Delilah looks adorable as she takes her strolls around the neighborhood! Posted On 03/22/15 by Sharon S from Keller, TX Yes, Sharon S recommends this product!